What Does “Open Court” Mean? The concept of an “Open Court” has been back in the news lately with the efforts of numerous groups to try to convince the United States Supreme Court to broadcast live the oral arguments on the marriage equality case coming up in April. I am a proponent of that. In this day and age of online streaming and immediate tweeting there is simply no good, legitimate reason not to allow all Americans live access to what is going on in the Country’s highest Court as it is happening. But the Justices on the U.S. Supreme Court, apparently, disagree. I understand that one objection to live broadcasting of arguments from Justice Kagen and Justice Sotomayor is they are afraid broadcasting arguments live might induce counsel before them to engage in theatrics and shenanigans. Folks, that is ridiculous. Utterly ridiculous. The Georgia Supreme Court has been broadcasting oral arguments before it for years without even a hint of theatrics from the counsel who appear before them. Members of the State Bar of Georgia are required to use the utmost deference before any judge, but particularly the Supreme Court. All members of the Bar know the proper etiquette to employ before the Court. The Court doesn’t have to worry about anything unseemly happening. And should there be any doubt about this whatsoever the Court is constantly manned by Georgia State Patrol Troopers. No one is going to do anything they shouldn’t do. This would be the same for the United States Supreme Court. The Georgia Court of Appeals, unfortunately, does not, at the moment, permit cameras in their courtroom. There is no explanation why other than perhaps a budgetary one. It is my understanding that when a new Judicial Building is built, in the footprint of the current Georgia Archives building, the Georgia Court of Appeals will then be equipped to allow live broadcast of oral arguments. I hope that is sooner rather than later. The United States Supreme Court may be feeling the heat. It typically makes audio recordings of oral hearings before it available at the end of the week. In the marriage equality case, the Court announced it would make the audio recording available the day after the hearing. In its most recent announcement on the subject, the Court has even moved that up and has indicated it will now make the audio recording of the argument available to the public that afternoon, the same day as the oral argument. If this is true, ask yourself: what is the difference between that and simply allowing all Americans to hear the argument in real time, in the privacy of their homes or at their work desks? I can imagine “oral argument parties” where citizens host viewing parties complete with coffee and Krispy Kreme doughnuts (make mine a Java Chip, please), or maybe Mimosas and Bloody Marys, so that they may enjoy the arguments in the company of their friends who are of like mind. After all, most things have richer meaning when they are shared experiences. The push for transparency of the United States Supreme Court is nothing new…it has been going on for years. Here is why it is so important. Our nation was founded on the concept of self-government, that “We The People” decide how our government will behave and “We The People” will decide how to govern ourselves according to the Rule of the Law and the sacred Constitution, which men fought and died for so we could be a Free Nation. 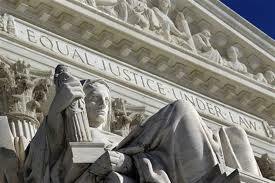 The United States Supreme Court is the final arbiter of the Law. It is the only body in our Nation that decides with finality whether something does not violate the U. S. Constitution. Do men and women not respect something and hold onto its principles more when they have been involved in its making? When they can see for themselves the fairness and equality used in its creation? Lack of information breeds suspicion. Secrecy creates mistrust. With suspicion and mistrust comes their ugly cousin, contempt. Why would the United States Supreme Court wish to risk such a side effect of their rulings? Why wouldn’t the Supreme Court want their opinions to be embraced by “We The People,” such that their opinions would have the stamp of authority with the public they rightfully should? It could easily be accomplished simply by livestreaming their oral arguments.